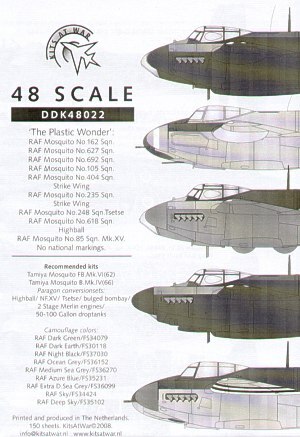 There is a number of excellent 1/48 Mosquito kits readily available to the modeller these days, along with a range of quality resin conversion sets for the less common variants. This new release from Kits at War enables the modeller to take full advantage of these resources and produce a variety of striking and unique RAF DH. Mosquitos. 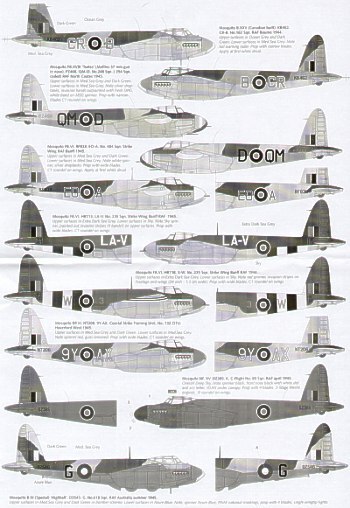 The options catered for concern late war aircraft, both fighters and bomber variants with single and two stage RR Merlin engines and some equipped modifications such as extended bombay or Mollins gun; a huge range of possibilities. 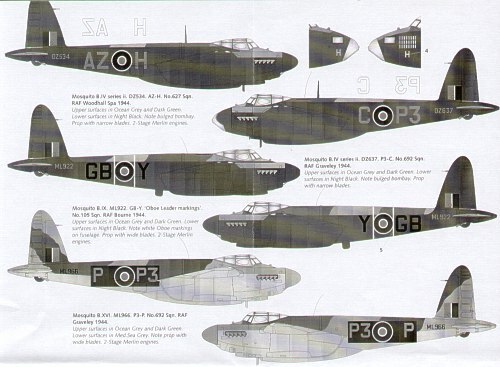 Markings for no less than 11 aircraft are supplied; roundels and stencilling will need to be supplied from the kit. The decals themselves are thoughtfully arranged on a single blue coloured backing sheet, the carrier film is thin, colour register, resolution and density is perfect and colours presented appear to be correct. Mosquito B.XXV; KB462. CR-B. 162 Sqn RAF 1944 Bourne. Ocean Grey/Dark Green over Medium Sea Grey. Equipped with tail warning radar. Mosquito FB. XVIII; PZ468. “Tsetse” QM-D. 248 Sqn RAF 1945 North Coates. Medium Sea Grey/Dark Green over Medium Sea Grey. Equipped with 57mm Mollins gun. Mosquito FB. VI; RF838. EO-A. 404 Sqn Strike Wing RAF Banff 1945. Medium Sea Grey/Dark Green over Medium Sea Grey. Equipped with droptanks. Mosquito FB. VI; HR113. LA-V. 235 Sqn Strike Wing RAF Banff 1945. Extra Sea Grey over Sky, invasion stripes. Mosquito FB. VI; HR118. 3-W. 235 Sqn Strike Wing RAF Banff 1945. Extra Sea Grey over Sky, invasion stripes. Mosquito RP. VI; NT208. 9Y-AX. 132 OTU RAF 1945 Haverford West. Medium Sea Grey/Dark Green over Medium Sea Grey, red spinners. Guns removed. Mosquito NF. XV; DZ385. “Joan” K. 85 Sqn RAF 1943. Deep Sky overall, Two stage RR Merlin, thimble nose. Mosquito B.VI; DZ545. G. 618 Sqn RAF 1945 Australia. Medium Sea Grey/Dark Green over Azure Blue, RAAF roundels. Equipped with “Highball” Bombay and arrestor hook. Mosquito B. VI series ii; DZ534. AZ-H. 627 Sqn RAF 1944 Woodhall Spa. Ocean Grey/Dark Green over Night Black, bomb mission tally. Equipped with bulged Bombay and Two stage RR Merlin. Mosquito B. VI series ii; DZ637. P3-C. 692 Sqn RAF 1944 Graveley. Ocean Grey/Dark Green over Night Black. Equipped with bulged Bombay and Two stage RR Merlin. Mosquito B. IX ; ML922. GB-Y. 105 Sqn RAF 1944 Bourne. Oboe Leader markings. Ocean Grey/Dark Green over Night Black. Equipped with Two stage RR Merlin. Mosquito B.XVI; ML966. P-P3. 692 Sqn RAF 1944 Graveley. Ocean Grey/Dark Green over Medium Sea Grey. Equipped with bulged Bombay and Two stage RR Merlin. This decal set provides the modeller with a quality product and an excellent range of options for the less commonly encountered Mosquito variants. Highly recommended for anyone wishing to produce a unique RAF Mosquito for their collection.